I have sweat bees that hang around the pool and sting whoever is swimming. They also sting when I am mowing the yard because I am sweating. What can I do to get rid of them in my area? Sweat bees will become very active in late spring and as summer sets in and people start to sweat, their presence will become more pronounced as they conflict with humans in the vicinity where they’re nesting. Sweat bees are mostly ground nesting meaning they commonly nest in soil. They’ll also nest in trees, just under the bark or in old abandoned holes left by other insects, so any stumps or wood piles are prime locations for sweat bee nests. We have several hundred species of sweat bees here in the United States and they have a wide range of looks and sizes. But the one thing they all have in common is that controlling them at their nest site can really help eliminate direct conflict and getting stung. Since they like to nest close to water and in a protected area, it’s quite common to find them around the pool and in the yard. To see if you have nests in your yard, do a good inspection of the turf looking for any flying insects coming and going that are using a sort of “path”. Sweat bees can be solitary meaning only one will occupy a single nest. But some species will have multiple members in the colony. In these larger nests you’ll stand a greater chance of seeing them active. Solitary nests can be tough to locate but in most cases where there is a single nesting sweat bee there will be multiple nests all independent of one another. In fact, it’s not uncommon to have hundreds and even thousands nesting in the yard if left untreated for just a few years. Since sweat bees will tend to migrate back to where they were born, a single nest will rapidly become many in very little time. If you have a lot of them flying around you in the yard or by the pool, chances are high you have a lot of nests somewhere on the property adjacent to all the activity. Two other things worth noting; lawns which are watered or otherwise moist will tend to attract sweat bees as will turf where the grass is recycled and not removed. In other words, if you don’t bag your grass clippings you’re only inviting more bees. The point is both decreasing the amount of water being used in the yard along with removing grass clippings will help cut back on their propensity to nest on your property. 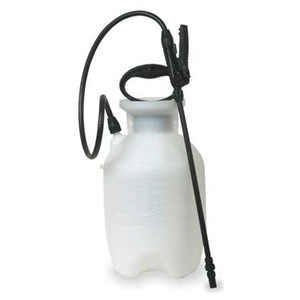 Now if you’d like to chase the bees away from the lawn and grass, a good repellent is NBS. This material uses nothing but plant essential oils and will provide 30+ days of relief when applied where the bees are active. Add 3 oz per gallon of water and expect to get 1,000 sq/ft of coverage per mixed gallon. NBS can be safely applied to grass, shrubs, decking, etc. using a standard PUMP SPRAYER. For large areas, use a HOSE END SPRAYER. 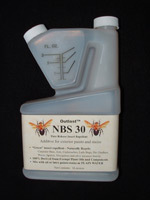 If you get our sprayer, you’ll add the whole pint of NBS to the sprayer and then add water so it’s half full. This will be up the 10 gallon line. Next, hook it to your garden hose and spray it over 5,000 sq/ft. Repeat monthly. Keep in mind NBS will not kill anything; its merely a repellent. So if you’re looking to control an ongoing issue in the turf with some kind of bee, spray ADONIS over the affected area. This product is commonly used for a range of turf infesting pests so anything nesting there or spending time on the grass will be affected. 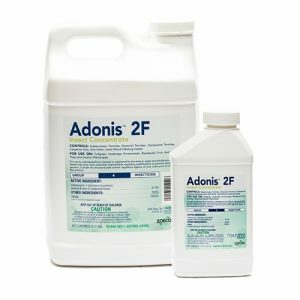 Adonis does not work quickly; it will take 2-3 days to kill targeted pests. But over a few days time insects moving in the area will pick up the active and die. For spot spraying, add 1 of of Adonis to a pump sprayer and spray the entire amount over 1,000 sq/ft. 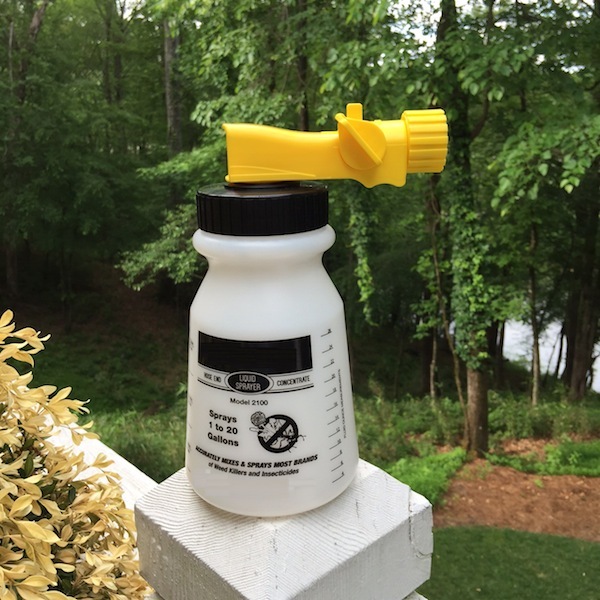 For use in the hose end sprayer, add 2.5 oz and fill to the 5 gallon line to cover up to 5,000 sq/ft of turf. Adonis is fine to use on the home, any plant, etc. so anywhere these pests are active, spray in the evening and retreat in a week if you see ongoing activity. But in general, one application will usually solve any problem. Is this safe for pets to be on the lawn? @kim: Yes. On each of the product pages, you’ll find “safety video’s” which go over in great detail how you can safely mix, apply and store our pesticide products. The real key is keeping children and pets away during the application and then off the treated area until it dries. Once dry, there is little to no risk of significant exposures. This is mostly true because the products have been diluted so much. Our videos cover all the key points you need to know and if you follow the recommendations, there won’t be any unnecessary risk to anyone. How would I stop them if they are nesting in the logs of my log cabin? Go with the Adonis listed above. Mix 1 oz per gallon of water and spray all areas where you see activity. Adonis won’t kill them quickly but after 2-3 days, they’ll be affected and be gone.